Lo de Marcos is a beautiful, small Mexican town just 12 miles north of Sayulita, Mexico, on the Pacific coast of Mexico along the breathtaking Riviera Nayarit. 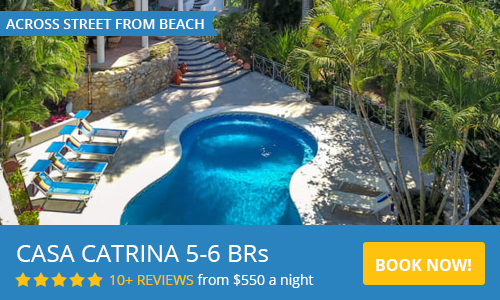 With a beautfiul, uncrowded beach and clear emerald water, Lo de Marcos has a quieter, attractive vibe, and is becoming increasingly popular for vacationers and those who want to stay and enjoy the gorgeous weather. For those who wish to find an upscale location for their Destination Wedding, look no further than Rancho Escondido. A private, gated community with gorgeous homes on large plots of land. Attending a Destination Wedding at Rancho Escondido or have extra guests that need nearby housing? Casa Molendera is the perfect option to house some of the wedding guests and is near the other homes within the gated community that serve as event venues? Casa Molendera is a lovely hacienda style home, spacious with three bedrooms, 3 baths and a private swimming pool.